Mary Bilecki joined the Lovin’ Spoonfuls team as a Food Rescue Coordinator in November 2017. 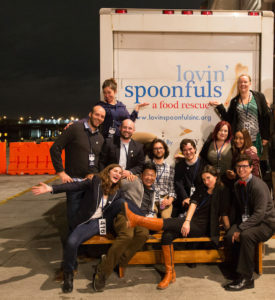 When Lovin’ Spoonfuls hired me six months ago I was brought on as a ‘floater’ — one of two Food Rescue Coordinators (FRC’s) who rotates across all seven truck routes including the greater Boston area and Metrowest. As a floater, I drive every truck, rescue food from all of our 70+ vendors, get to know all of our 150+ beneficiary partners, and work alongside each of our seven outstanding food rescue coordinators. To say I was initially intimidated would be an understatement. Thankfully, today I know that I never have to face a situation alone and that I can always rely on my fellow FRC’s for support. Our team is always working on optimizing routes for efficiency, and scheduling a clear plan for each day. However, the best days in food rescue are the days where there are surprises when we work together to find the best home for the food we rescue. Food rescue happens fast, food rescue is unpredictable, and food rescue cannot happen without a foundation of passionate, hardworking individuals. As FRCs, it’s our job to be constantly thinking about where the nutritious, perishable food will wind up. We each have our own toolkit filled with the skills we use to deal with the uncertainty associated with food rescue. As a floater I’ve got the hookup — I get to observe each of my teammates and learn all the best techniques. From how to load the truck to ensure the boxes don’t topple over while merging onto the expressway, to learning that clear communication with beneficiaries and each other is paramount. Our text thread is full of updates, “Running light today on produce in Marge” “Rose is heavy on dairy and prepared” “Tess has a ton of produce, we can bring some extra to Marge’s beneficiaries” (yes, our trucks are named after the Golden Girls). 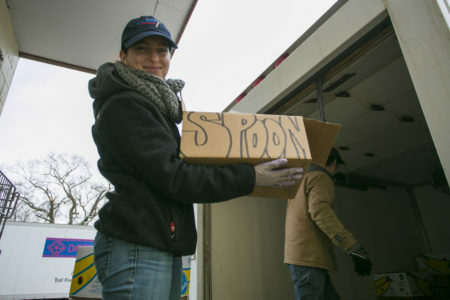 While I was initially overwhelmed by the logistical details and the sheer amount of how much food the Lovin’ Spoonfuls trucks move each day, these anxieties have eased solely because I know no matter what situation I may face on any given day I have a support system there to help me problem-solve. It’s a privilege to work alongside such passionate and experienced team members. Between the food rescue coordinators there are decades of experience working for both nonprofits and corporate organizations; in food systems, community development, management and art therapy with a variety of degrees in gastronomy, sociology, anthropology… the list goes on. What we all share is a commitment to fighting food insecurity driven by the knowledge that hunger can be solved by redirecting food waste. When I first moved to Boston, it was to start this position working for Lovin’ Spoonfuls. I knew only four people in the area, I didn’t have an apartment and I had no understanding of the city’s layout or New England culture. Lovin’ Spoonfuls welcomed me with open arms and has since taught me so much about Boston, food insecurity, food waste, communication, logistics, and teamwork in an incredibly short amount of time.